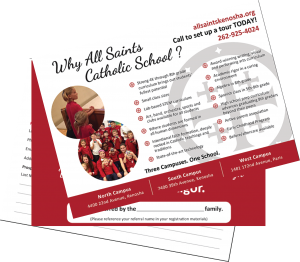 Word of mouth has proven to be the most successful and credible advertising for All Saints Catholic School. We are grateful for the many families that have become part of our school community because of the confidence you’ve placed in our school and the enthusiasm with which you speak about it. Purpose: The purpose of the program is to reward current All Saints Catholic School families for increasing and sustaining enrollment at All Saints Catholic School. Award Definition: A referral award is part of a defined referral award program. A referral award is paid to a current All Saints Catholic School family who successfully recruits and/or refers a new student to All Saints Catholic School. The referring family must have a currently enrolled student at All Saints Catholic School and the referred family may not have attended All Saints Catholic School in the past. In order for the referring family to be eligible for the award, they must complete and submit the referral family card to the school office. Referrals will be accepted throughout the year. The certificate is available in the school office or completed online below. Although the referral will be accepted throughout the year, the referring family must complete the referral family card prior to the referred family contacting All Saints Catholic School. Exception may be made for those referred families who clearly identify the family who referred them at their initial contact with the school. Once a family is referred to All Saints Catholic School, a school representative will make contact with the referred family to invite them to an Open House, tour the school, offer an opportunity to shadow in the class, or provide additional information about the school. The referring family should continue to promote All Saints Catholic School and act as the prospective family’s ambassador. The Refer-A-Family program will remain in effect for the duration of the school year. The Refer-A-Family referral award will be available while enrollment is below capacity. If enrollment reaches full capacity, the referral award program may be suspended. The Refer-A-Family program award amounts and policies will be reviewed by the All Saints Catholic School Board in conjunction with the school principal and finance committee on an annual basis. Not all aspects of this program will be in writing. The Refer-A-Family program award amounts and policies may be modified or discontinued at any time. Final approval will be made once the Refer-A-Family Program Referral Certificate is signed by the referring family, the referred family and a representative of the All Saints Catholic School Administration. The Refer-A-Family Award will be rebated from the LAST tuition bill(s) of the school year. The LAST bill(s) will be defined based on how families elect to pay tuition. If tuition is paid in full with one payment, the award will be rebated from the only bill they receive. If tuition is paid biannually, the award will be rebated from the 2nd If tuition is paid monthly, the award will be rebated on the last bill or bills of the school year.